Planning a trip to Arizona? Don’t forget your bolo tie! The bolo tie is the official neckwear of Arizona, and you can definitely get ready for a taste of the Wild West when you visit this state’s rugged terrain. It has been said that crying was only acceptable at funerals and the Grand Canyon. Also known as the Grand Canyon State, Arizona is ground zero for the geological phenomenon, welcoming thousands of visitors yearly to view, hike or climb this dazzling structure of pristinely preserved rock layer unmatched by any other canyon on the planet. The great Albert Einstein also once said you could be in two states at one time. Of course, he was talking on the metaphysical level, but did you know that in Arizona you could actually do just that? The Four Corners is a region of the United States where the southwestern border of Colorado meets the Southeastern border of Utah, meets the northeastern corner of Arizona, meets the northwestern corner of New Mexico, and visitors to the Four Corners can put a body part in each one. The Four Corners is also home to the capital of the Navajo tribal government and has also been the setting for a number of Hollywood Westerns, so it’s certainly not camera shy. While Arizona is so often sought by tourists for its natural resources and pleasant weather, it is also a state of vibrant industry and entertainment. Greater Phoenix is the 14th largest metropolitan area in the United States, boasting everything from the artsiest communities to the ritziest resorts. 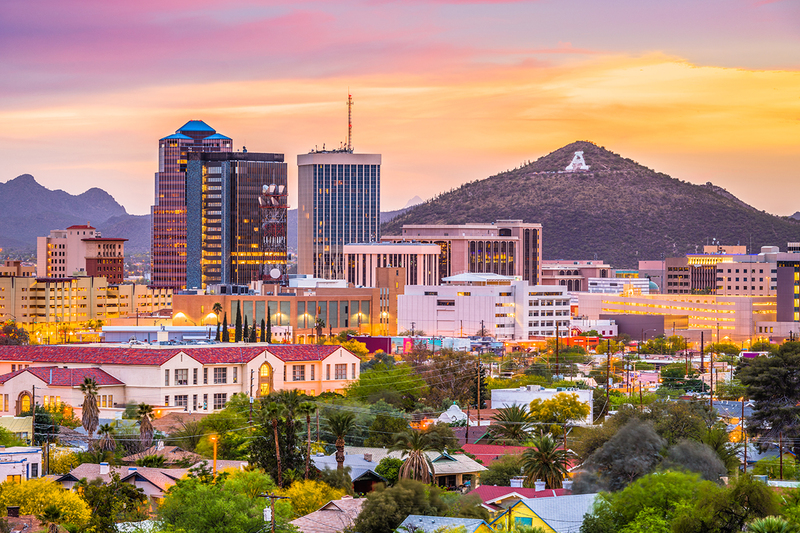 Those, along with a healthy collegiate population (Arizona is the home of the country’s largest university), bordering desert landscape, and miles of suburban sprawl make Greater Phoenix one of the most popular tourist and homeowner destinations in the country. As for the Arizona economy, it’s all about the 5 C’s. Although they no longer play a huge role in the state’s economic growth, Arizona owes its success today to its production of copper, cattle, citrus, cotton, and climate. Arizona leads the country in copper production, it’s responsible for a good deal of beef (cattle) export to the rest of the world, it’s a leading cotton state, and it’s got one of the best citrus crops a desert could raise. Its climate experiences over 300 days of sunshine per year, and that’s one of the greatest exports an area can have. Speaking of the C’s in Arizona, don’t forget about its chimichangas and cheese crisps! The indigenous Latin and Native American cultures have had a huge influence on food, and the chimichangas and cheese crisps are just two of the things you can’t leave Arizona without sampling. As such a vibrant state, it might not surprise you to know that Arizona has spawned a fair share of country music artists. Tanya Tucker, Waylon Jennings, and Dierks Bentley are just a few who have drawn inspiration from the desert nights and lonely moons of Arizona, and there have been a number of other celebrities who claim Arizona as their birthplace as well. David Spade, Mary Louise Parker, and Ted Danson are all proud Sand Cutters, and Arizona is proud to call them its own. Our Lavelier store is located strategically at 2502 E Camelback Rd, Phoenix, AZ 85016, where you can enjoy all the best C’s in Arizona while adding another of your own. Coral seaweed, otherwise known as Corallina Officinalis, is the key ingredient in Lavelier’s luxury skincare, containing high levels of micro-nutrients that are supremely beneficial for the skin. When you’re cruising it in Arizona, be sure to drop by Lavelier to enjoy our free product demonstrations and VIP facials.